The Old Ones Have Risen! Monsters Walk the Earth! Humanity is finished, but the struggle continues. Which Great Old One will rule the ruins of Earth? Now, you take charge in Cthulhu Wars, a fast-moving, competitive, tabletop strategy game of Lovecraftian horror in which 2 to 8 players face-off to determine the fate of the planet. 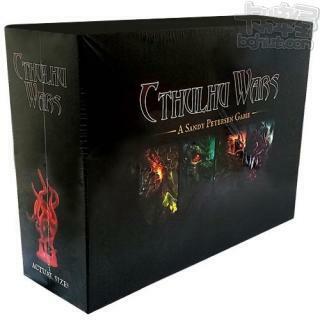 In Cthulhu Wars, you can play as Great Cthulhu himself, or take charge of other monstrous factions seeking to dominate the world such as the slithering hordes of the Black Goat, Shub-Niggurath, the aquatic terrors of the Crawling Chaos, or the insane minions of the Yellow Sign. Recruit cultists, summon Shoggoths, cast spells, open interdimensional gates, and awaken your inner Great Old One in Cthulhu Wars!